Boy, do we love a good Porterhouse Steak in our home! Add some garlic dill butter to this dish and dinner time turns into a mouthwatering event. Porterhouse Steak is a substantial and indulgent cut of meat that’s often referred to as “The King of Steaks” and for good reason! 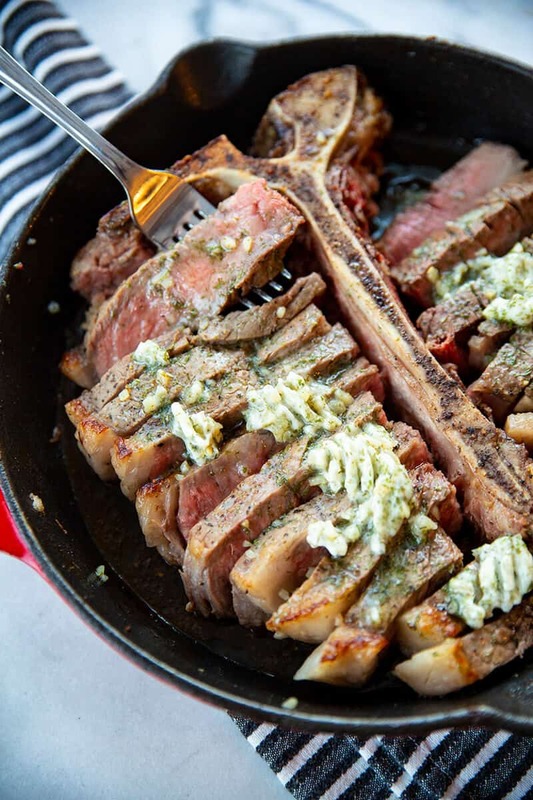 And when it comes to cooking this Porterhouse Steak with Garlic Dill Butter “just right”, the key is in the skillet! Also, Garlic Dill Butter is actual heaven to my tastebuds. I dare you to disagree (…okay well you can disagree, but at least try it first!). What’s the Difference Between a Porterhouse Steak and a T-Bone Steak? 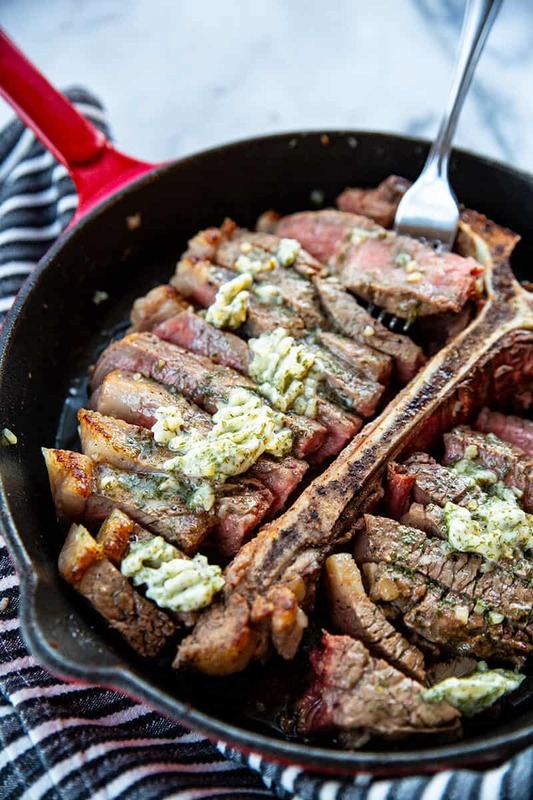 The Skillet Porterhouse Steak is very similar to the T-Bone Steak; they both provide a mouthwatering combination of tender filet mignon and a robust steak that’s bursting with flavour. The difference is that the Porterhouse Steak comes from a bit farther back on the cow and has a larger tenderloin section. It’s easy to get confused, so make sure that you get the right one when you go into the butchers. Let the porterhouse steak sit out on the counter for 30 minutes until it comes to room temperature. Combine the butter compound ingredients and set aside. Pat with paper towels then rub a generous amount of salt and pepper on both sides. Start your oven broiler with the oven rack set to the second from the top, not the very top. Place the oil in the bottom of a cast iron or oven-safe skillet and place on the top oven rack and heat up. Once the oil is heated, place the steak into the hot skillet and sear until browned as you like, around 4-5 minutes, Do not flip. Remove the pan from the oven and then remove the steak from the pan and place onto a cutting board. Carefully and quickly cut meat from the T-bone as shown in my photos. Place the bone back into the skillet and then place the sliced steak around the T- bone so that it looks like a whole steak again. Replace the steak so that it is the same side up as it was when you broiled it. Slather half of the butter compound over the steak and return the skillet to the oven and broil again for another 5-6 minutes or until it reaches medium rare or rare. Remove from the oven and serve topped with the remaining butter compound melting on top. How Thick Should a Porterhouse Steak be? When buying your Porterhouse Steak, look for one that’s at least 1 inch thick. For ultimate excellence, you should try to find a Porterhouse Steak that’s even thicker, i.e. between 1.5 and 2 inches. Butchers will sometimes sell “thin” cut steaks but they’re not even on the same radar as a thick meaty Porterhouse cut, so avoid these at all costs! What are the Health Benefits of Porterhouse Steak? Ok so red meat isn’t amazing for you. We all know that. But it’s not going to kill you either unless you’re eating it for breakfast, lunch, and dinner daily! The Porterhouse Steak has 9 grams less fat than the T-bone so it’s definitely the healthier option of the two. Porterhouse Steak is also full of vitamin B12, iron, and zinc! This type of red meat can be enjoyed as part of a healthy diet once or twice a week. What Should I Serve with Skillet Porterhouse Steak? 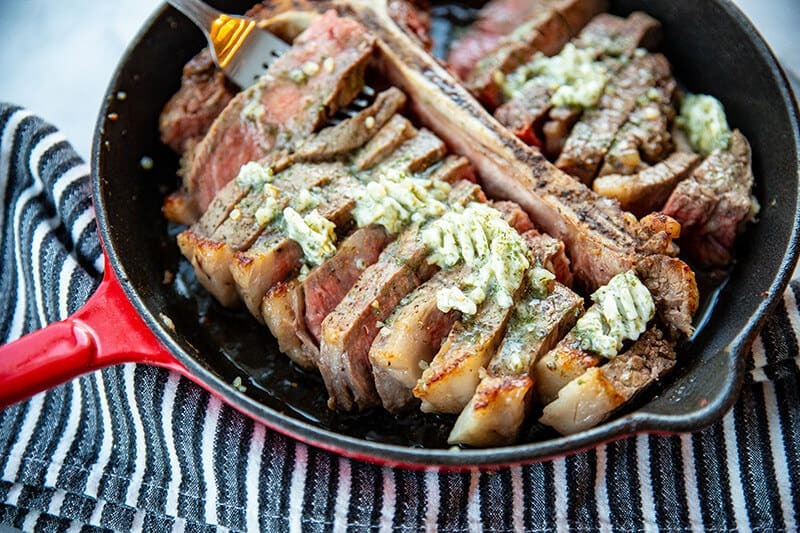 There are countless side dish options for this Skillet Porterhouse Steak with Garlic Dill Butter so I tend to go with what’s seasonal! Some of my favourite sides include; grilled sweet potatoes, broccoli salad, tangy carrot slaw, grilled zucchini salad, or mashed potatoes. I’d love to hear what you end up serving alongside this delicious recipe! Make sure to get in touch and let me know when you’ve given it a try! BBQ Steak & Horseradish Guacamole: a unique and delicious combination for when you hit the BBQ! Mushroom Crock Pot Cube Steak & Gravy: got a crockpot? You HAVE to try out this super yum cubed steak! Crock Pot Flat Iron Steak with Portobello Mushrooms & Potatoes: this is another absolutely scrumptious recipe for the crockpot… have you bought yours yet?! Steak Oscar Recipe: you need 4 essentials for this absolutely decadent recipe – a darn good steak, crab, asparagus, and Hollandaise sauce. BBQ’d Steak With Sauteed Vegetables: not into weird steak sauces? This is the perfect side dish option! Place the oil in the bottom of a cast iron or oven safe skillet and place on the top oven rack and heat up.